Looking for a French language holiday for adults? Our residential French courses are intended for adult students wanting to make a significant jump in confidence and ability. Classes are small (no more than six adults) and are taught by professional French language teachers in a relaxed and friendly atmosphere. Our private language school, L'Atelier des Langues, is in the medieval quarter of Gourdon, a typical town in the Lot and Dordogne area of France. Outings and activities are part of the programme, and in your free time you can explore the area, shop, dine and immerse yourself in French life - great opportunities to put into practice your newly-acquired language skills! When you book, we will assess your level with a short test, to help us structure the course to suit your needs. It is possible for couples or groups attending the French course together to select different course options. The Top-up French Course is also suitable for students who would like to study outside of our published course dates, such as those who feel they need a preparatory week before their group course. Each Top-up French Course is tailored to each student's requirements. The course content can be agreed in the light of the previous week's progress and can fit around your holiday itinerary if you wish to explore the region. 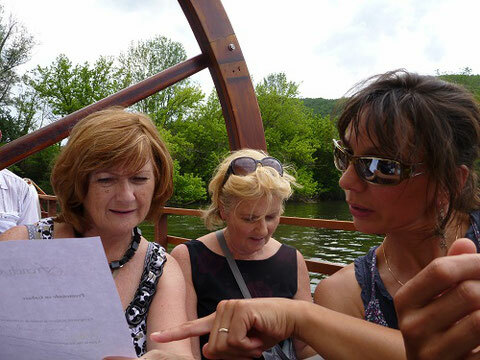 Learn French with our intensive, residential French courses for adults in the Lot & Dordogne area of France!